Herb Robert has the botanical name of ‘Geranium robertianum’ and is regarded as a medicinal herb. Said to be named after Saint Robert the Abbott of Molesme, Herb Robert can be grown from seed in the home garden. A member of the Geranium family the botanical name is ‘Geranium robertianum’ and this herb also makes an attractive garden plant. Regarded as an annual or bi-annual it can easily be grown in pots and will self seed. Pretty pink flowers during late spring to summer make an attractive addition to the border. Herb Robert or ‘Geranium robertianum’ prefers a shady damp environment. Generally easy to grow in these conditions. This is a plant that needs to be carefully controlled as it tends to be a little ‘weedy’ in the right conditions. We suggest growing this particular herb in pots, as it is more easily controlled. Dead head after flowering to prevent seeding. 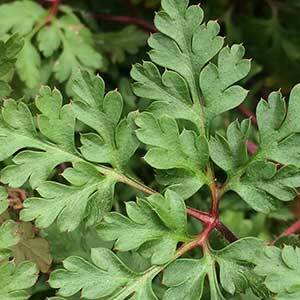 Herb Robert is used to treat toothache, nosebleeds and other medical problems. Consult with a registered practitioner before using herbal remedies.